: Take the opportunity to wonder the kingdoms of ancient cities and modern Yangon. Mingle the diverse architecture of the city, magnificent Shwedagon pagoda and bustling down town in Yangon. Arrival at Mandalay and transfer to down town. Hotel check in and afternoon at leisure to explore the busy streets in the afternoon. Pick up from your hotel and drive to Amarapura and take a stroll on U Bein Bridge, which at over a kilometre is believed to be the longest teak bridge in the world. On the return, pay a visit to lively jade market where you will learn how to purchase the green stones. Business is conducted here in tiny picnic tables where buyers, sellers and experts examine the stones and negotiate the prices over a cup of tea. Then, continue to Mandalay local workshops to see Kalaga tapestries being made, gold leaf being beaten into paper-thin pieces. Visit Mandalay Royal Palace in the afternoon and end the day with a sunset view from Mandalay Hill. 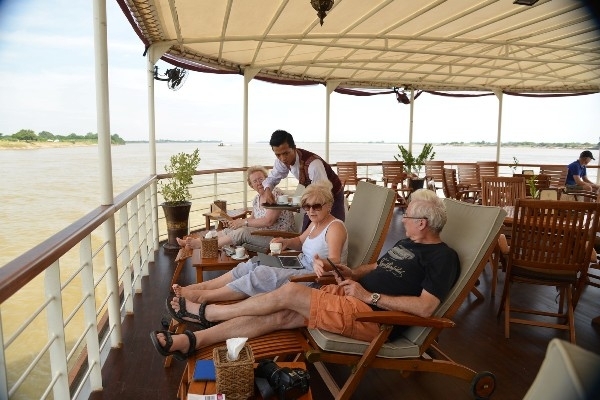 Transfer to the Sagaing jetty for cruising all day long. In the late afternoon, the cruise stops at Yandapo, a village specializing in Pot – making, where the peace treaty of the First Anglo-Burmese war was signed on Feb. 24, 1826. We visit the Pot workshops, the monastery and the school. Early in the morning we continue downstream to Bagan. After breakfast (if time permits) we visit an-other typical river village. Enjoy the sunrise near Bagan. 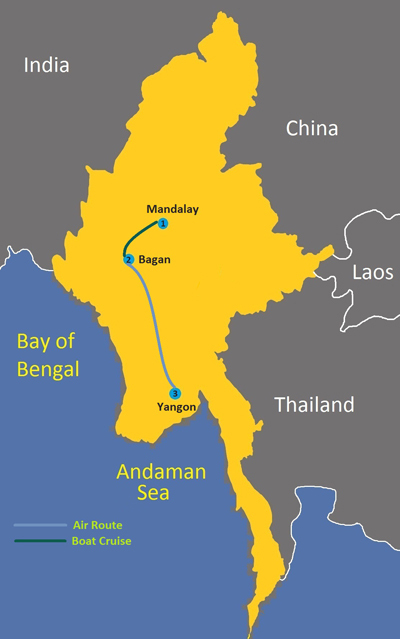 Passengers will disembark at Bagan Aye Yar jetty by 9:30 hrs. After refreshing up, your discovery in Old Bagan begins with some of the site’s most important monuments such HtilominloTemple, , one of the greater temples of Bagan, Ananda temple, an architectural masterpiece, built 1105 AD in the early Mon-style, Ananda contains two unique Buddha images whose expressions seem to change depending on the distance and angle from which the statues are viewed. Continue to Thatbyinnyu Temple standing within the city walls, rises to a height of 201 feet above the ground and overtops all the other monuments, Gubyaukgyi Temple which dates back to the 13th century AD and Sulamani Guphaya Temple. Around 0530 hours the Balloon over Bagan shuttle bus will pick you up at your hotel (Please contact the balloon travel desk for exact pick up time). You will drive to the departure ground of the Balloons. While the team makes the Balloon ready to go, you enjoy some refreshments, but you can also take great pictures of this event. The unique opportunity to enjoy spectacular views of the ancient Kingdom of Bagan in a hot air balloon! A balloon flight gives you the chance to see Bagan with a bird’s-eye view. The balloon basket provides an excellent platform for photography, with unrestricted views of the whole Bagan Valley. Then, depending on the wind, you will over fly Bagan for about one hour, and enjoy spectacular views of the ancient Kingdom of Bagan in your hot air balloon! The tour ends…..where ever the wind has brought you. A glass of sparkling wine ends this fantastic event….and the shuttle bus then brings you back to your hotel. Breakfast and relax at hotel. In the afternoon, visit nearby villages to learn agriculture production and village life. Meet the people in the farming to share practices of seasonal plantations such as sesame and various kinds of beans and local products from plantations. Balance of the day at leisure to explore your individual interest. The guide and car will be at your disposal. On arrival, welcome at the airport and transfer to downtown with a brief introduction enroute. Then, explore this fascinating Yangon taking in the city’s best examples of British colonial architecture and the winding city streets. Then, take a stroll to Indian Quarter, local markets offer an insight into local life ,contemporary art galleries. Transfer to hotel for check in. Afternoon return to the city to witness the most sacred Buddhist site in all of Burma—Shwedagon Pagoda. Also known as the Golden Pagoda, the 2,000-year-old hilltop temple complex covers more than twelve acres and dominates the Rangoon skyline. Transfer to airport for flight to Yangon. On arrival, connect your international flight to home. Tipping to the guide,driver etc..
Cruise journey is available from October to end of March. The above itinerary is indicative and some details may change according to conditions and availability; you will always be informed of such changes. There may be changes to estimated prices depending on air fuel cost, domestic airfares, US$ exchange rates and festive season surcharge. All supplemental cost to be advised. Would you like to extend your tour to the beautiful and relaxing Ngapali Beach or Ngwe Saung? Our travel consultant will be able to arrange this for you, along with any other travel, accommodation or activity requirements you may have. Just click on the ‘Enquiry’ button. Reservations should be made as earlier as possible and 20% deposit is required UPON booking confirmation. Apart from the deposit for the cruise, remaining deposit is refunded if the tour is cancelled 60 days prior to your travel date. Names as per passport, passport numbers and nationality are required at time of booking.